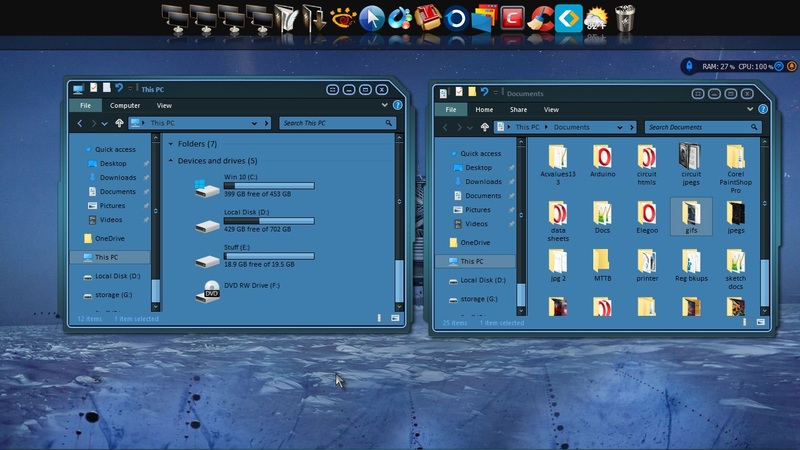 After booting up my laptop this morning I noticed some of the icons had reverted to the white page like icons. I reapplied the icon pack then checked to see if these changes had been made, they were not. Not all of them. See my SS below. Any suggestions? I only get this from older IPs. Try loading a different one and then load that one again. Ok......So I did that, changed the icon pack and after about a minute I got a black screen. No icons, no dock, no taskbar, no nothing. I had to do a CTRL+ALT+DEL to restart my laptop. Only two of the icons on the dock changed. The rest were unaffected. I'm hesitant about changing it again for this reason. Hello, anyone home? I'd like to get this problem solved please. 1st. Object Dock is not supported on Windows 10. On the Windows explorer side with IP. 1. Try to use the default IP pack that come along with IP and see if the problem still there. 2. If the problem still there, please try the elevated "SFC /scannow" to see if you have any corrupt Windows System files. So this is what I done. Loaded the default icon pack, same result. Complete black screen. Restarted and called up the command prompt, elevated. Typed in sfc /scannow and two hours later it comes back that some corrupt files were found and repaired. Ok, one problem solved. I loaded the icon pack I had been using and it went rather smoothly, and faster than it had been. No black screen, all the icons were changed save one. I had to put the download icon back. Now I have a new problem. Both default icons and the ones I applied. See screenshot below. Decided to give it another go. Before I unzipped the package and installed it by clicking on the IP icon. Next I tried doing it through the IP UI. Both ended with the same result, SS number one shows only three of the icons. Then I zipped it back up and opened the IP UI again. I clicked on options then on install from disk. Went to the zip and clicked on it. I got the pop up saying please wait while the icon pack is being installed, I didn't get that before. All the other times I opened IP it didn't show the icon pack installed. Only that same number of icons. SS number two shows the preview. Note that some of the icons are blank. These are all the ones that have not changed. Should I uninstall it and start from scratch? Sure, but that is one package, Dragon Tails. Do you have any issues that remain with the stock packages? 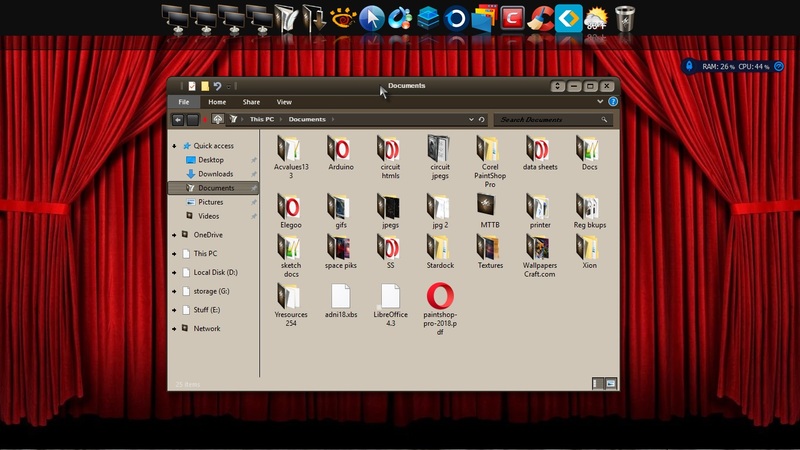 What I can not understand is why all the icons do not show up or install, even tho they are all in the icon folder. But it does not happen with all packages. Since I'm the one that created this package , I investigated on my end. I'm using Win 7 x 64 bit. 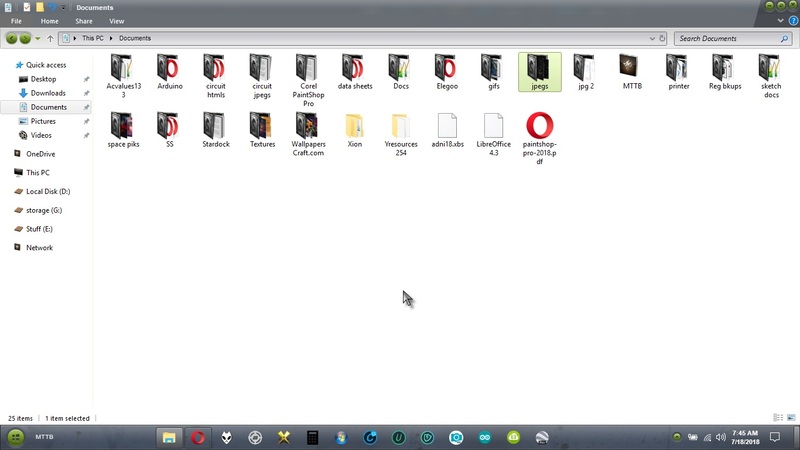 I installed the package on my computer and it is working perfectly and all the icons are displayed in the preview and all icons appear as they should. The icons even have 15 different size formats from 768 x 768 to 20 x 20 , so that should not be an issue. It's a mystery to me as to why it does not function properly elsewhere. Could be a problem with windows 7 vs windows 10. I even tried running IP with admin privileges. I tried these same package on my Win 10 and all apply correctly. I save this text from another thread when I was having problems on Win 8, I don't know if it will work on 10. Just as a side note, I went into the folder on the C drive to add the .bak extension. I did a search for iconcache* on the C;\ drive. Found about 6 of them. Went to that directory in a DOS box and renamed them all to iconcache*.bak. All those files were re-created. I deleted all the *.bak files, and voila! Perfect. Even applied a few icon sets with no problems. I have all 8 of my latest iconpackages loaded into the IconPackager software and have been using them for months now without a hiccup or an issue, so....my guess is that it has to be something with Windows 10 or other conflicting software like possibly an antivirus or anti-malware program. It kind of smells like borked up file permissions to me. Ross, right-click on one of the actual extracted icon files that isn't loading in your Icon Packager Themes directory and make sure security permissions for "Users" is set to at least "Read & execute" and "Read". Well, I did this. I uninstalled IP and noticed this: On my dock none of the icons reverted to the default. Also one icon did not change at all. Look at the icon that says circuit jpegs. Next I'll re-install it with run as admin to see if that helps. I even rebooted after the uninstall. Had to because I got that black screen again with only my cursor working. I went to SD for a fresh copy of IP but I can't find a way to get to my downloads. I know I have the latest version but I was hoping a fresh install would do the trick. Unfortunately I couldn't get there so I went to the bottom of the page and clicked on product keys. It sent me an email with the product keys for older versions. None of those compatible with Win 10. What has changed. I was always able to get to the full list of OD programs. So...here's what I done. I installed IP from the backup installer package. That install went well. Then it updated. That too went well. 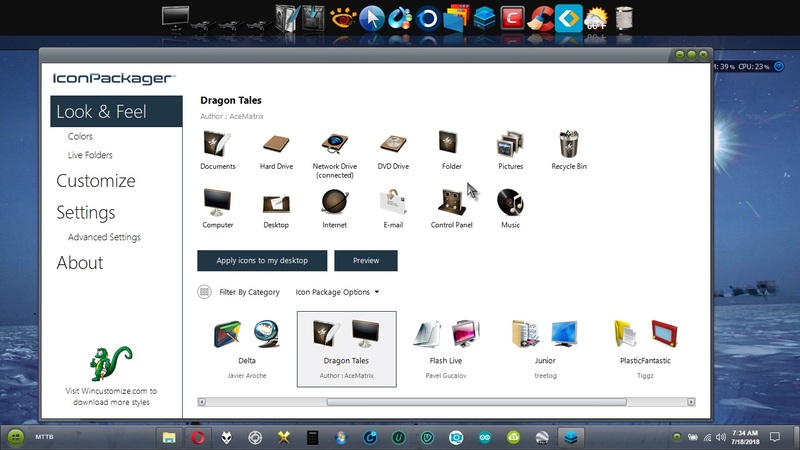 I did notice that Dragon Tales was still installed but displaying only the three icons. I clicked through each of the icon packs I have and the each displayed all of the icons. 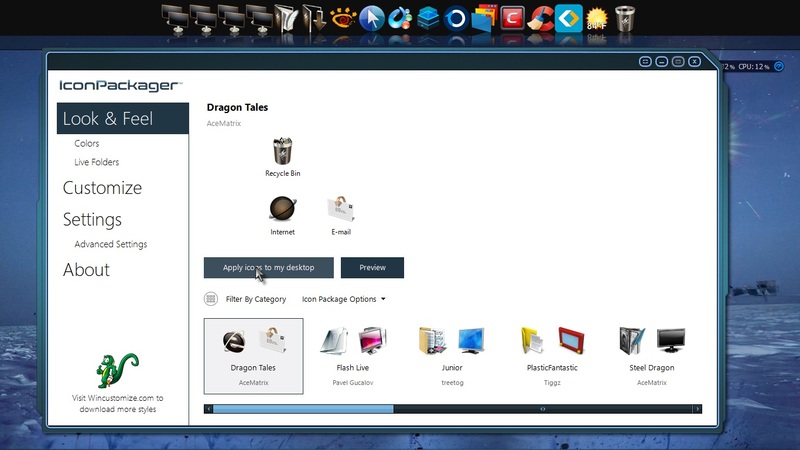 I installed Steel Dragon, also by Ace Matrix and it went smoothly. No black screen, everything intact. Dragon Tales seems to be the only one affected. Ross , I'll send you a link to download Dragon Tales again and see how it works out for you. In the mean time just delete that entire folder and replace with the one I'm sending you. The first SS shows all the icons from Dragon Tales where they should, a plus. 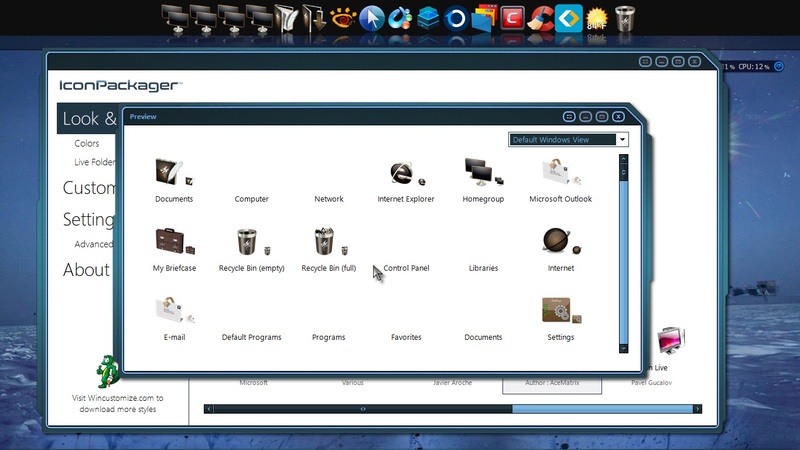 However, after installing it through the UI from the zip package the majority of the icons did not change. See the second SS. 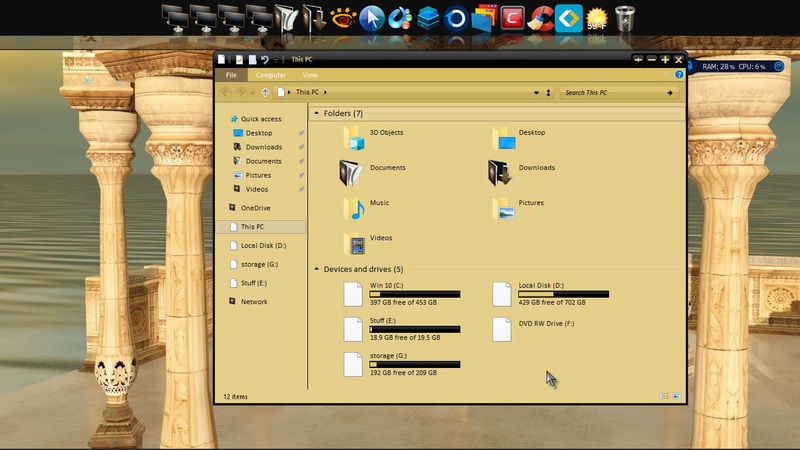 Notice on the far left the drive icons changed but in some of the folders there are no changes except those that reverted to Windows default. I'm at a loss here. What about me? I purchased Dragon Tales too. OK ...well , I didn't know that you were still experiencing problems. I seriously doubt that it's the iconpackage itself causing the issue. After all, it's just an ordinary folder with pictures in it. Nothing more , nothing less. But , I'll send you a link as well if you will private message me with an email address that I can send the link to.